NEW! Plant produces good yields of 5" long orange sweet bell peppers. 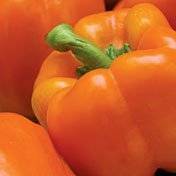 Pepper has thick walls and is excellent for salads, stir fry, and gourmet dishes.